Many sleep masks come with earplugs included. 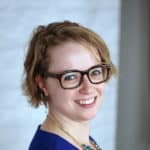 It makes sense, if you think about it: if you’ve got trouble sleeping because of ambient light, you probably also have trouble with ambient noise (especially if you’re trying to sleep while traveling). But the earplugs included with most sleep masks get lost easily, probably won’t last as long as the masks themselves, and do a questionable job of blocking out sound. So does the Sleep Master, a mask that promises built-in sound muffling do a better job, do a better job than a mask-earplug combination? Keep reading to find out. Try this silky-smooth sleep mask from Sleep Master for the full "lights out" experience! Looking to improve your sleep mask game? Check out my personal favorites! The Sleep Master is big and bulky. 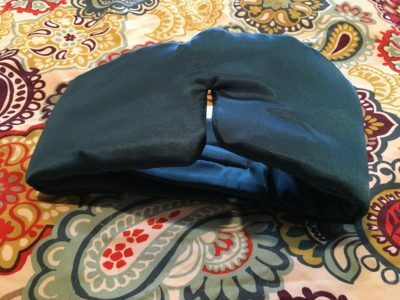 Unlike most masks, which are made of the mask component, which covers your eyes, and the strap, which attaches to the mask, the Sleep Master is all one piece—the blue satin padded mask wraps completely around your head without tapering in width, presumably to ensure the promised sound muffling. The very back of the mask, which closes with Velcro, is the only section of the mask that’s unpadded, and despite my general loathing of Velcro, I wasn’t terribly bothered by its presence in this case, as it’s sewn into the middle of the strap, with a good inch of fabric above and below it, making it much less likely to catch your (or your pets’) hair. Getting the Sleep Master on isn’t easy. Because it’s all one piece, there’s no stretch to the strap as you try to adjust the mask on your head, and the added width of the strap made it harder for me to hold the bottom part in place while I brought the top over and tried to line everything up so the velcro caught the way it was supposed to. It was difficult to make minor adjustments from there, so it was difficult to get the mask tight enough without multiple attempts. An Amazon reviewer suggested first wrapping it around your forehead and pulling it down over your eyes after adjusting the mask. I found this method to be much more effective. The strangest part of wearing the mask is how it wraps all the way around your head and covers your ears. I’m not used to having something on my ears when I’m sleeping (I can’t imagine that many people are, come to think of it), but this is clearly what helps the sound muffling, so I committed to giving it a go. 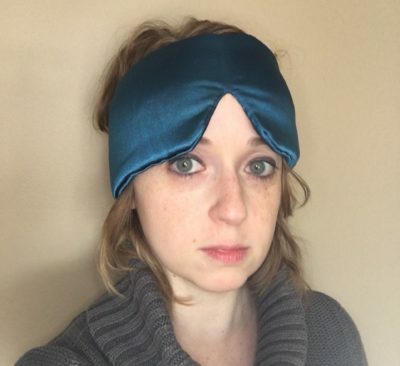 The Sleep Master sleep mask is very large and wraps all the way around the head, completely covering the ears. I wanted to test the muffling while I was still awake enough to experience it in action, so I put on some music and set the sleep timer, getting an un-muffled baseline as I finished getting ready for bed, and then putting the mask on while still upright in bed. And … there was almost no difference. I moved the sides of the mask up and down just to confirm, and the volume of the music was the same with and without my ears covered. The only change, when the mask was over my ears, was that the music sounded a little distorted. Not muffled—more like the difference between listening to a song out of your phone’s speaker as opposed to through earphones. I suppose I would have noticed a bigger difference if I used the included earplugs, but that would defeat the entire purpose of having a mask that muffles sound. Still, I hoped that the mask might at least make my husband’s snoring a little less noticeable…but it did not. What it did do, as I lay on my side trying to fall asleep, was slide around a bit. Covered with the sith slick satin that faces the entire mask, my ear and the side of my face kept sliding around on my pillow when I first put my head down, making the mask shift as well (usually in the opposite direction of the rest of my head. But eventually, I was able to get into a comfortable, stationary side-sleeping position and I fell asleep. 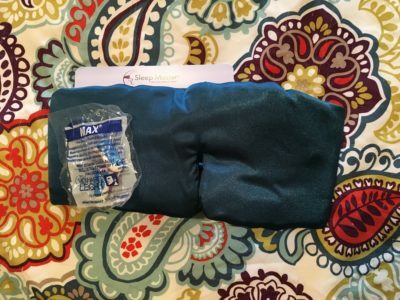 The mask’s packaging includes an “Insider Tip” that suggests freezing the mask in its plastic bag during the day and then wearing the mask cool overnight. This might have helped with the overheating I experienced when I wore the mask all night, but according to some of the other chillable masks I’ve tried, falling asleep overnight with something cold on your eyes can mean waking up in the morning with temporarily blurred vision, so I decided to try the chilled mask, instead, for a quick relaxation break between a mid-morning yoga class and an afternoon of writing. Five Star Review: “I don’t wake as often at night and love that light doesn’t peek in.”—I did notice a little bit of light seepage through the bottom of the mask, but the mask went far enough down toward my cheekbones that the light was sufficiently far from my eyes and didn’t disturb me at all. 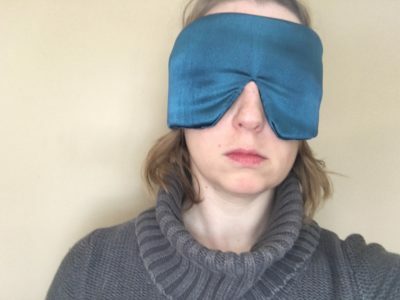 One Star Review: “It put unwanted pressure on my eyes [and] it was hot.”—I didn’t think the pressure from the Sleep Master mask was any worse than the pressure of other masks that lack indentations (and in fact may have been a little better due to the padding), but if you don’t like having something up against your eyes at all, you’re definitely not going to like this. And I second this and several other commenters who said the mask was too hot to sleep in. I did sleep, but woke up awfully sweaty. Other Options: The Sleep Master Deluxe Model, which features a pocket on the mask for earplug storage and includes a carrying case, is available for $25.95 through the or $29.95 on Amazon. Return Policy: Sleep Master offers a 30-day money-back guarantee and will refund the purchase price of the mask less shipping and handling. Amazon’s standard return policies apply if you buy the mask there. 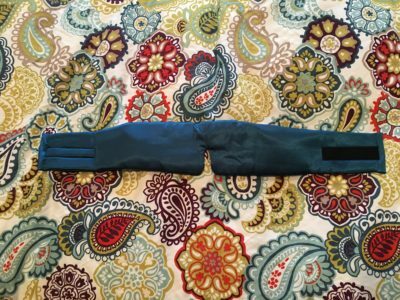 The Sleep Master is easiest to fit if you first wrap the mask around your forehead and close the Velcro before pulling it down. It makes a cute headband, too! The Sleep Master fails to deliver on its main promise—that it will muffle sound. It does come with earplugs , but I doubt you’d have a different experience wearing them with the Sleep Master mask than with any other mask. Despite this, the mask is comfortable, although hard to adjust, and does a good job of keeping light out despite it not being a blackout-style mask with eye contours. 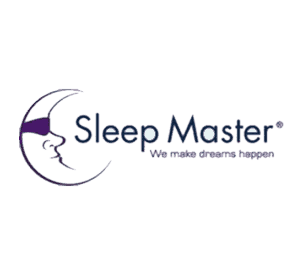 You’ll have to decide for yourselves if the Sleep Master is worth its steeper purchase point, but over the course of trying out sleep masks, I’ve certainly seen masks I thought delivered less bang for my buck. Ready to buy? Grab the Sleep Master Sleep Mask on Amazon!